We observe Veterans Day this week, a time when people across the United States remember and thank those who have served in the military. While the military remains one of the most respected institutions in the U.S., it’s also one of the most misunderstood. Active duty service members represent less than one percent of the U.S. population and service has increasingly become something that is limited to the communities that surround military bases and the families who live there. As the military’s makeup has shifted, so too has it ideology — to one that is increasingly focused on combat rather than diplomacy.Things didn’t always used to be this way. Up until the end of the draft in the early 1970s, service provided an economic opportunity for millions of Americans and shined a light onto what it meant to serve the country with duty and honor. 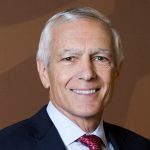 With more than 30 years in the military and a subsequent career in politics, Gen. Wesley Clark has a unique perspective on this transformation, and some ideas about how to bridge the empathy gap between soldiers and civilians. We also talked with him about veterans running for political office, his support of Colin Kaepernick, and whether democratic dissent has a place in the military. Clark visited Penn State to promote Renew America, a new nonpartisan organization aimed at reducing polarization and ideological divides in America. Do you think military service has changed in America? If so, do you think that change is good or bad? Do you think it’s a problem that a vast majority of our military comes from a shrinking portion of society compared to when a draft was in place? General Clark speaks about the importance of all young people being involved in the protection of the nation or service in some way. Do you think this is something we should require from young people? General Clark also speak about the need for national service in terms other than military. Can you think of any way to implement such a program? Do you agree with General Clarks’s stance on this and his support of Kaepernick? During the episode, the issue of a “warrior ethos” is brought up where the military is becoming more combat minded. What do you think about this? What changes would you make to the military today to improve it? [4:30] What inspired you about Gen. Douglas MacArthur’s “Duty, Honor, Country” speech? General Clark: Just before I attended West Point, General MacArthur made what would be his final public speech. When my class arrived in 1962, we got a printed form of this speech. When you read it, it just made you shiver. He talked about what it was like to be a solider and a soldiers responsibilities. He spoke about how soldiers were supposed to win the nations wars and not question policies. It was incredibly inspiring. [7:00] We hear a lot about an empathy gap between different parts of society. Does such as gap exist between those within the military and those outside of it? General Clark: Oh absolutely. People don’t serve the way they used to. Back during the draft, if you went to a land grant institution like Penn State, you knew you were going to be in ROTC. You were a part of the nation defense. If you look at these schools now, there is not this military participation. Something changed in the way we serve following the end of the draft. A few years ago I was teaching and some students expressed concern that the volunteer service wasn’t representing the nation. I think when young people who didn’t serve offer thanks to those who did, they don’t get it. That isn’t what serving is about. That doesn’t really help. We should all be in this together. We should all share this duty and this sacrifice. [10:13] What is the solution to closing that gap? General Clark: We need to pull the country together. What I’d like to see is real national service. This country needs major work done, such as our infrastructure system. If young people could come together for a year with those different from them socially and economically, they would be greatly enriched. The military is also becoming less representative of society. Children often follow their parents. Therefore, if your parents didn’t’ serve, you’re unlikely to do so. Another change is the mindset of those in the military. There used to be an idea of the solider as being thoughtful and well read. However, we have now moved towards a warrior ethos. This change occurred in the 90’s. Today, the Army is very focused on winning its mission at the tactical level. This drives a wedge between different generations of the military. [14:00] What does that change of ethos towards a warrior mentality mean for democracy? General Clark: When these men come out of the military after several tours, they simply can’t give it up. There was just an article recently about how former military were being hired as mercenaries to kill political opponents. That is very disturbing when you take those skills out of the service and apply them for financial gain. [15:00] Did you see this shift happening during your career? General Clark: I just saw the beginnings of it. It was really the invasion of Iraq and the subsequent occupation that brought about this change. Some of this change was good. There were some changes that needed to take place to prepare people to fight. You also need a form of outreach to the American people, and it can’t just be about your favorite gun. [17:00] What do veterans bring to the table as elected officials? General Clark: First off, it really depends on the person. What you’d hope to see is someone with a better understanding of the military and an appreciation for sacrifice. Many of these veterans are just as indoctrinated as those who haven’t served. [18:36] It seems as though democrats have struggled to get veterans out as a voter group for them. Why do you think that is? General Clark: If you look at veterans holding elected office today, roughly two thirds of them are republicans. Today, the democrat party has become the “mommy party” and the republicans have become the “daddy party”. Democrats stand for fairness while the republicans stand for security. [20:00] We’ve seen a decrease in support amongst veterans for Trump. How do you balance following orders from someone you may disagree with? General Clark: There is no tension. You follow the orders; period. People asked this of me when Clinton was in office. Until he is removed from office, he is the boss. [21:12] Do you think that democratic dissent has a place within the military? General Clark: No. I think that if you get an illegal order, then your obligation is to not follow it. If you get an order you don’t like, you can disagree with it, but don’t expect your boss to agree with you. You always have the right to speak up, but you then have to face the consequences. This isn’t to say those in the military can’t vote. However, voting is private. You don’t bring that back into your job. 23:00: What went into your decision to come out in support of Collin Kapernick? General Clark: I’m one of the few people to be at the top of the military, political, and business world. When you get to see things from that perspective, you see that there is a lot of injustice. Sometimes we don’t live up to our values. This stems back to our founding in our founding documents. I think treating people with respect is the absolute foundation of democracy. So when Collin Kapernick took a knee, I didn’t see that as an insult to the flag or the military. I saw that as standing up for the values we fought for. [25:16] We have seen many military figures serving positions within the Trump administration. How do you see this impacting how government works? General Clark: I think General Mattis is proving to be a very solid Secretary of Defense. H.R. McMaster was very capable, but he wasn’t prepared for the position he was put into. Any White House is difficult to work in due to conflicting agendas. This is a situation unlike the military where doing a good job can get your promoted. In the White House it is more of a popularity contest. John Kelly is also in a difficult position, but he is taking his challenges head on. He also has to deal with ethical issues, such as Trumps children receiving Secret Service protection while conducting private business in the Middle East. [30:01] You are starting an organization called “Renew America.” Tell us a little about that. General Clark: We’re trying to engage with young people interested in renewing the country. Politics today is a very nasty and dirty business. If you look throughout history, politics goes through cycles with different focuses, such as economic and social policy concentration. You have to see the big picture then break through the entertainment news cycle. I’m hoping that we’re going to mobilize a core of young people who are going to demand answers from people running for office. If you’re asking real questions you will change the political system. [31:00] How do you think Renew America fits in with similar efforts to increase youth engagement in politics? General Clark: We are interested in working with everyone. We make no claim to have a monopoly on this effort. We simply want to offer a platform for people to speak with others who are likeminded on a nonpartisan basis. There are many similar groups, but they are partisan. We are not.